Today I am talking to one of our most inspiring members. Hello there, tell us something about yourself. Hi, my name is Ali and I’m from Saudi Arabia. I studied my Master of Science in Advanced Mechanical Engineering at Cranfield University, academic year 2016/2017. What was your role in the walking society? I was the Photo Editor. As a committee member, my role included helping the committee in planning the walks but it was mainly to document every walk we had and share it through our social media pages. Congratulations! You have won an award from the walking society. Thank you! I received the Chief Photographer award during our last year’s Christmas pub walk to North Crawley . What were your 3 favourite walks and why? Snowdonia National Park: A hiking trip for three days with a group of energetic and lovely members of the walking society. That experience showed how a team can work in a tough environment like climbing Snowdon Mountain. Olney Christmas Market Walk: A walk that included passing by and seeing several attractive locations along the River Great Ouse and Olney River Meadows that are nature, the old market town and the Christmas market with a flavour of Victorian England. Stevington Windmill Walk: A special walk to view an impressive postmill (a type of windmill that could be turned to face into the wind) built in the 18th century and the only complete windmill left in the county of Bedfordshire. A historic windmill which is sort of hidden, a stunning place to visit in Bedford. Being a member of this society gave me the opportunity to enjoy two things. Firstly, wondering around the beautiful countryside, villages and towns and knowing about their fascinating history. Secondly, I was honoured to work with and learn from the committee and our friends, Kristina and Alan, who all were driven by passion toward making this society lively and successful. Why would you recommend anyone at Cranfield University to join the walking society? I don’t think I am exaggerating when I say that the Walking Society does complete the studying experience at Cranfield University, especially for international students like me so I strongly recommend it. Thank you, Ali ! It was a pleasure talking to you. Keep on walking and all the best in your future endeavours! Ali and fellow members of the walking society at Chicheley Hall. This entry was posted in Blog, More than walking, News, Social event and tagged best photos, Cranfield students, interview, membership, new members, photographs, Photography, student committee. These are the four amazing photos taken on our walks between September 2011 and June 2012 that were voted by our student members as the winners of Cranfield University Walks photo competition 2011-2012. Congratulations! The winners will receive prizes donate by our sponsors: Angela Jane’s Farmhouse Kitchen, Lodge Farm, North Crawley: homemade cakes, ice cream & more. The Beesness: delicious preserves, jams & honey. Glynise King, Sherington: tranquillity holistic therapies (book a massage via university’s Medical Centre). The cafe bookshop @ Cranfield campus: fresh coffee and cakes, books & more. Digital Visitor: kindly donating a ‘cycle pack’ with a helmet, gloves, puncture repair kit, light and bike tool kit. Cranfield Students’ Association – a bottle of bubbly. Special thank you goes to our competition committee that so brilliantly managed the competition: our Photo Editors Belen Iglesias and Xiaojian Huang. All photos entered into this year’s competition can be viewed via our Photos page. 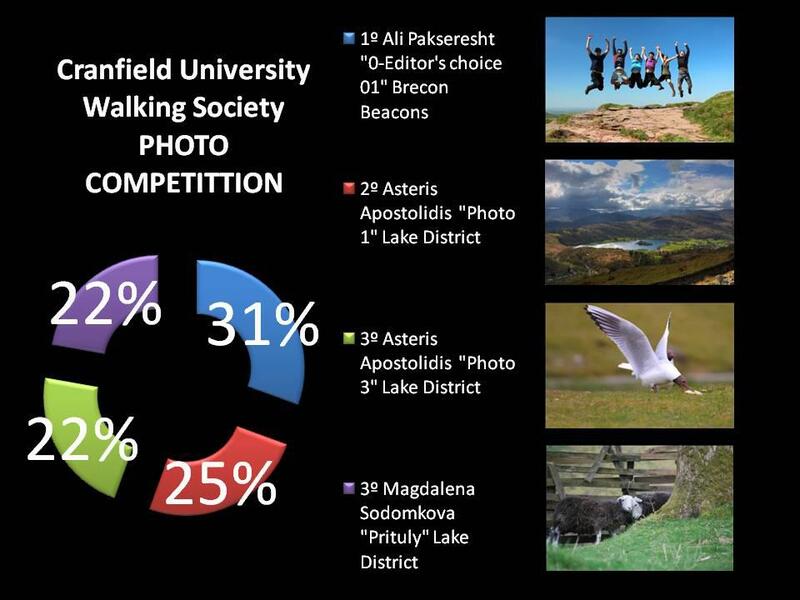 This entry was posted in Blog, Walks and tagged best photos, Brecon Beacons National Park, Cranfield students, Lake District, photo competition, photos, photos from walks, sponsors, walks.